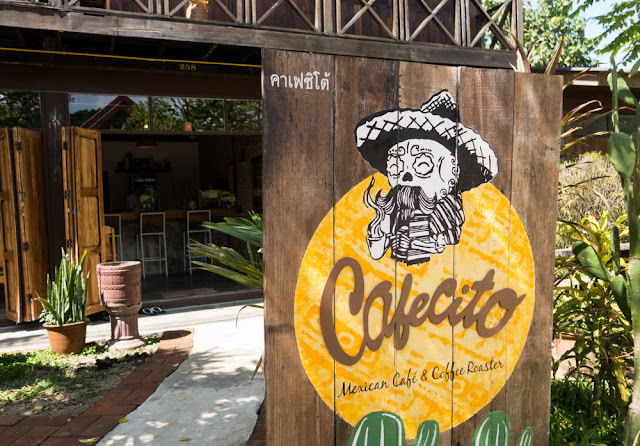 Cafecito, a wonderfully addictive Mexican cafe in Pai, Thailand. Look, I'm just going to say it. I kind of want to go back to Pai, just so I can have that bodacious smothered burrito at Cafecito again. 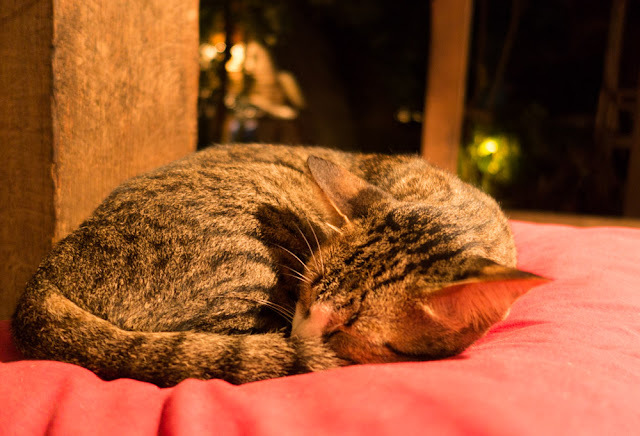 Hang out with the kitties at Edible Jazz while I listen to live music and tuck into a bowl of tom kha. 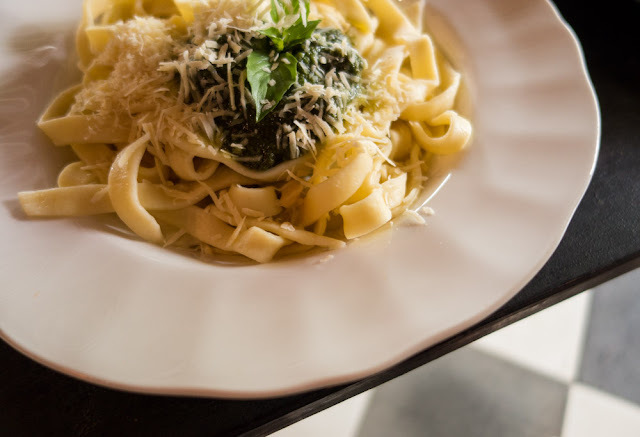 Indulge in fresh pasta at 661 Food and Crafts. A common complaint about Pai is that it is too touristy. The Western influence is too strong. It's not an "authentic Thai town". Fair enough. I can understand how someone who visited Pai decades ago might be dismayed at how it's changed since. During our trip to North Thailand, we visited our fair share of lovely little places that are barely touched by tourism, and yeah, part of me kind of wants those places to always stay that way. But I'm not one of the people who visited Pai during a different era. This current Pai is the only Pai I know, and that's how I'm approaching it. And you know what? 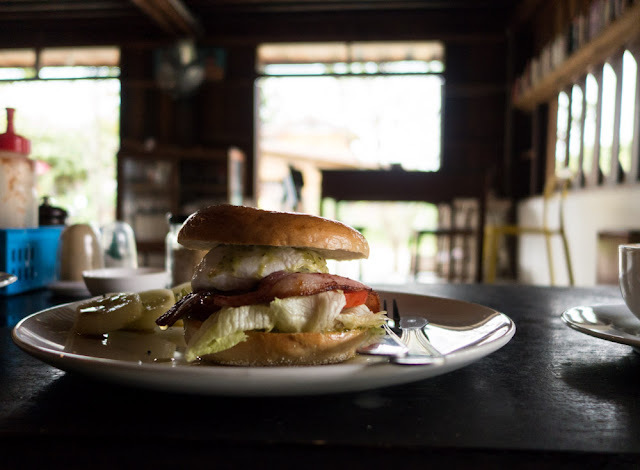 We were right smack in the middle of a multi-month Asia trip when we visited Pai, and I loved the cafe scene here, which gave me access to a number of foods I've missed since we left Melbourne. 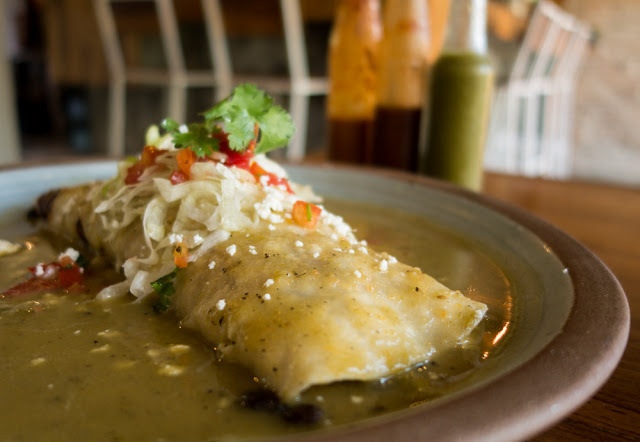 I absolutely adore Thai food, but isn't it delightful to also have Mexican and Italian cuisine around if I feel like it! I think it's cool that there are people all over the world who have settled down in Pai, and I appreciate that they are passionate about making and serving good food. So this post is an ode to the eateries that made our stay at Pai fabulous. Let's start with Cafecito. 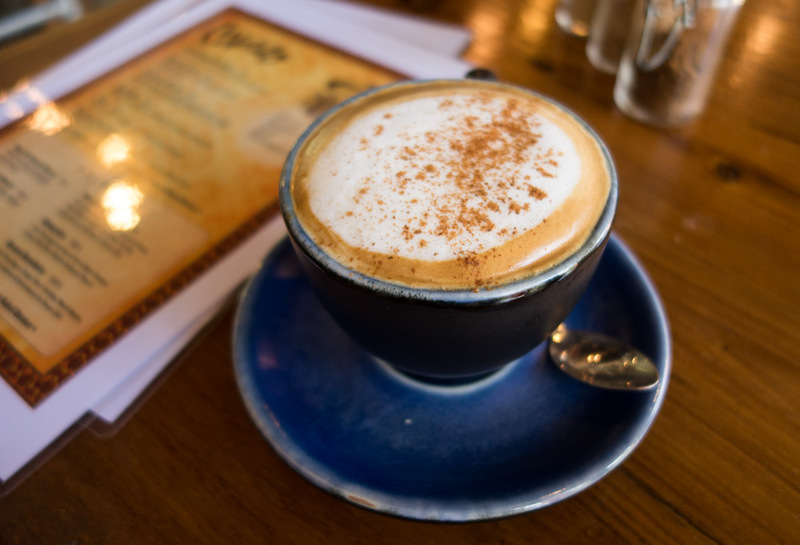 This is Simon's cappuccino. Look how gloriously smooth and velvety it is. Behold my iced roselle tea. 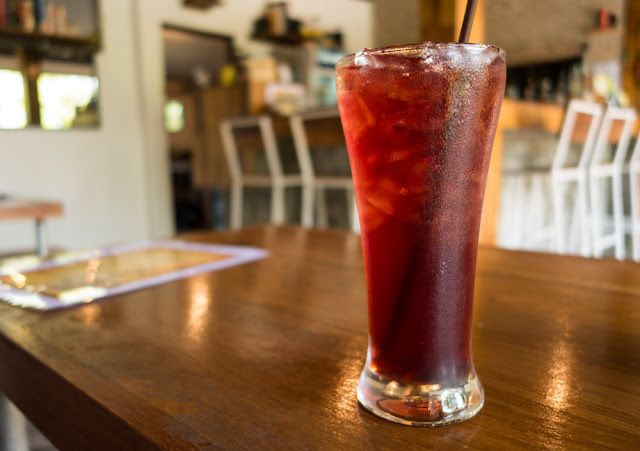 Roselle is a type of hibiscus, and it yields a thirst-quenching drink with a pleasant hint of astringency. Iced roselle tea, also known as roselle juice, at Cafecito. Some of the items on the menu come with a choice of fillings: marinated pork, avocado, braised mushrooms, or pulled chicken. 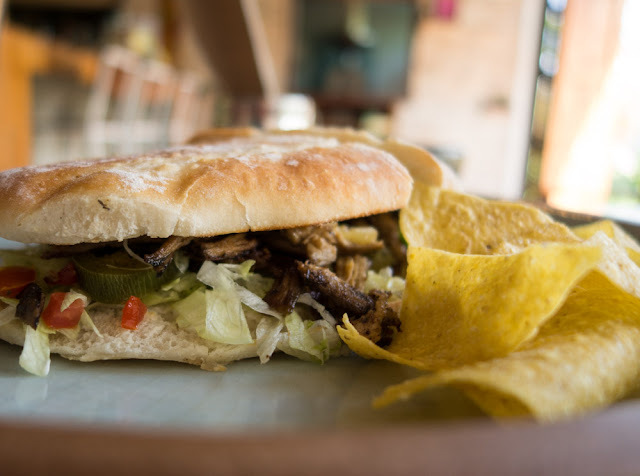 On our first visit, I tried the Mexican torta - that is, a Mexican sandwich - with the braised mushrooms. Dustin, the owner from Colorado who runs Cafecito with his Thai girlfriend, said he wanted to offer a vegetarian option that tasted just as satisfyingly substantial as the meat options. I'd say he hit a home run with this mushroom option. Fantastic texture, great umami flavour. You definitely don't have to be a vegetarian to enjoy this. A vegetarian Mexican torta with braised mushrooms at Cafecito (120 baht). So good. Then there is the plump and inviting smothered burrito with cheese, cumin-spiced black beans, and avocado, drenched in a luscious chili sauce. I believe we went for a marinated pork filling with this one. Oh, and did I mention they make their own tortillas here? And their own hot sauces? Smothered burrito at Cafecito (145 baht). We were so happy with our meal that we went right back to Cafecito for brunch again the very next day. 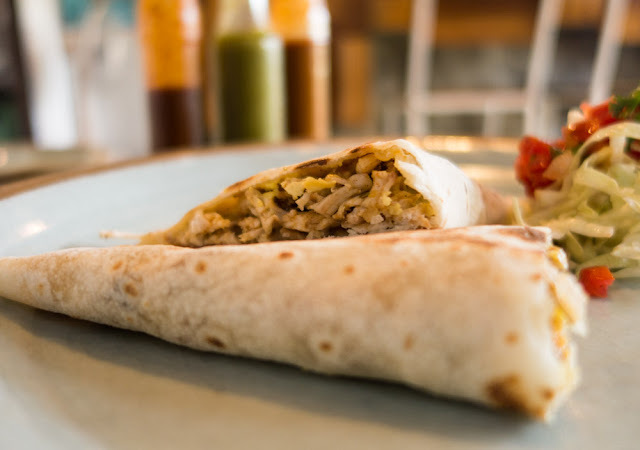 We gave the pulled chicken quesadilla a go. Another scrumptious dish. Pulled chicken quesadilla at Cafecito (135 baht). 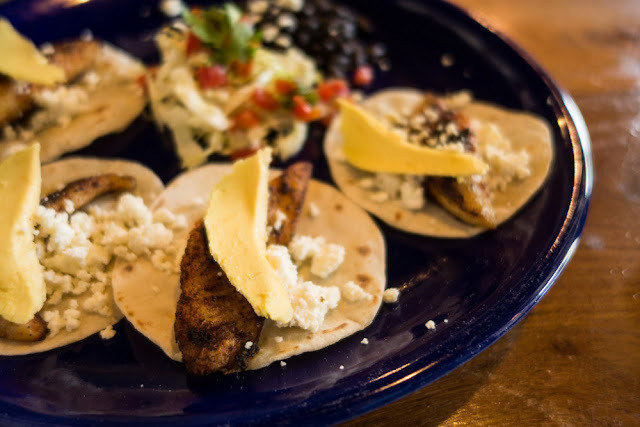 Plus, the blackened fish tacos, which were also excellent. Blackened fish tacos at Cafecito (145 baht). Cafecito also does baked goods, and the offerings seem to change each day. We got a chocolate chip muffin, which did a very nice job in its role as a chocolate chip muffin. 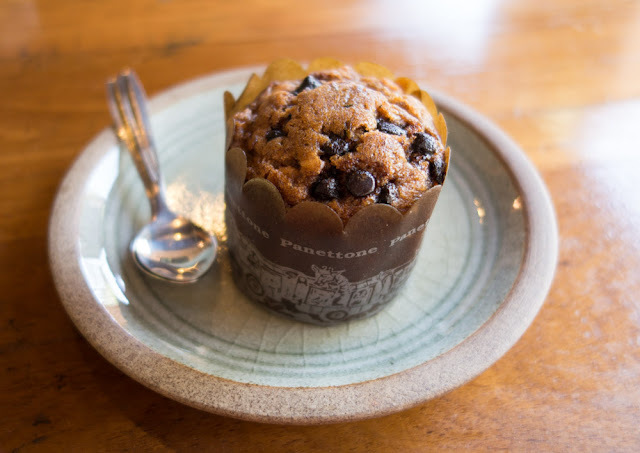 Chocolate chip muffin at Cafecito. Moreover, Dustin gave us some nifty ideas for exploring the area. We took that on board, and after an afternoon of catching the breeze in the countryside of Pai, we returned to the town center. 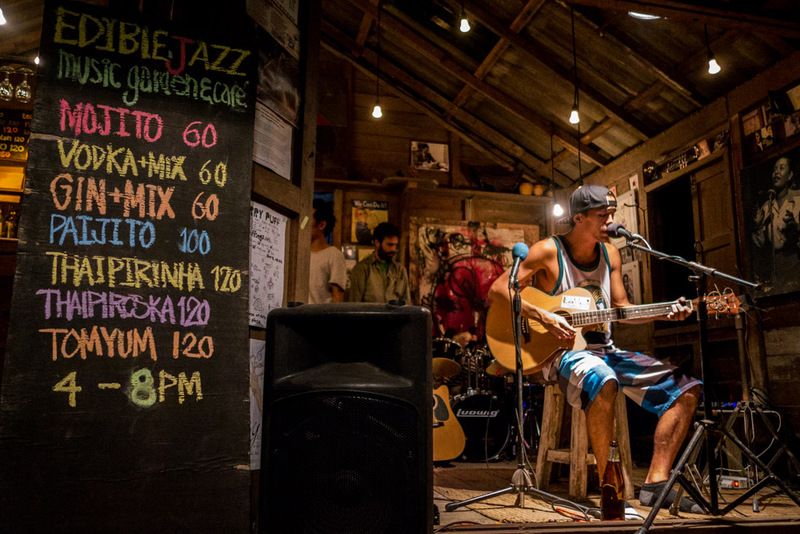 We had a few snacks at the night market, and then we decided to pop by Edible Jazz Garden Cafe and Bar. I had my sights set on it already after reading somewhere that cats might be available for patting here, and after Dustin mentioned it to us as well, I felt that we really shouldn't miss it. So we walked in, and... Oh, hello there. 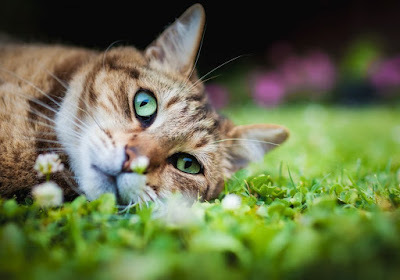 Obviously, we made ourselves comfortable and took a seat on the floor right near this kitty. 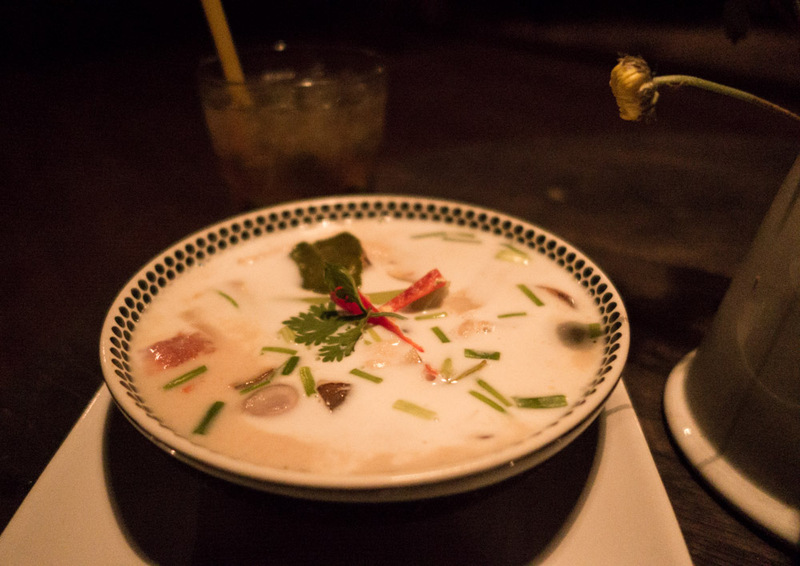 I went for a Thai dish - tom kha gai - chicken cooked in coconut milk with galangal. 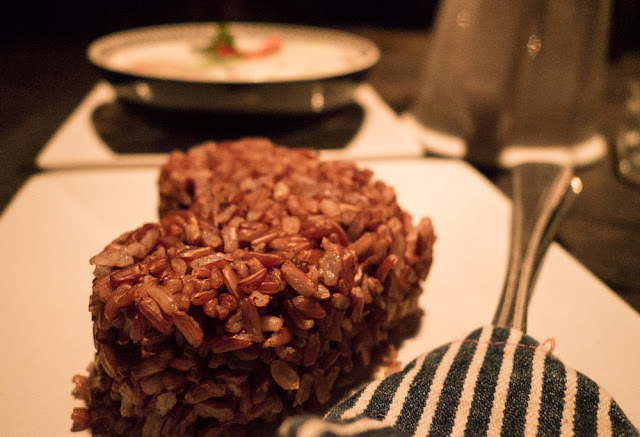 It came with a serving of steamed red rice. Look at the adorable presentation. Just look at it. Lovely presentation of food at Edible Jazz. I regarded Edible Jazz as more of a live music venue, but it turns out their food stands on its own. My chicken tom kha had a beautiful balance of flavours, harmonious as an artfully orchestrated mini-symphony. Tom kha gai at Edible Jazz. Simon already ate enough at the night market, so he skipped the food menu and went straight to the cocktail menu. There were some interesting options, but in the end he settled for a good ol' trusty mojito. He liked it enough to get a second one, and I happily stole a sip or two, as well. Live music at Edible Jazz. We were only there for the earlier portion of the night, so we have no idea if it got rowdier later, but while we were there, we found the atmosphere at Edible Jazz to be friendly, chilled and relaxed. It was splendid to check out the live music while partaking in their delicious food and drinks. And let's not forget about the cat-patting. 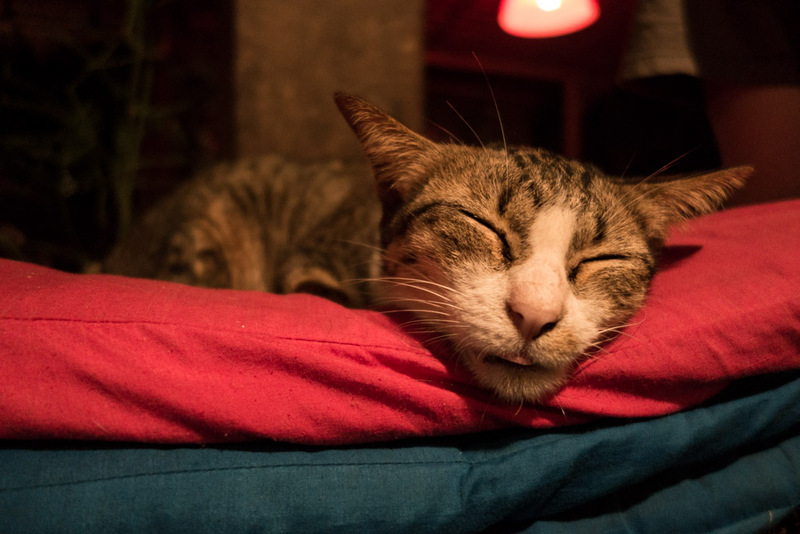 Happy kitty, sleepy kitty, purr purr purr... at Edible Jazz. On our final morning in Pai, we eagerly made our way to Cafecito again for one last hurrah before we were due to catch our bus to our next destination. But wait! Just a stone's throw away from it was 661 Food and Crafts. I had been intrigued by this cafe ever since I saw a cat sunning itself on the front step one afternoon, though it was closed that time. The cat was nowhere to be seen this time around, but hey. Apparently the 661 cafe is owned by a Swiss-Thai couple, and there is the promise of fresh pasta at the premises. That's enticing enough for me! Simon and I shared an icy passionfruit shake here, and it certainly did a fine job of perking me up. 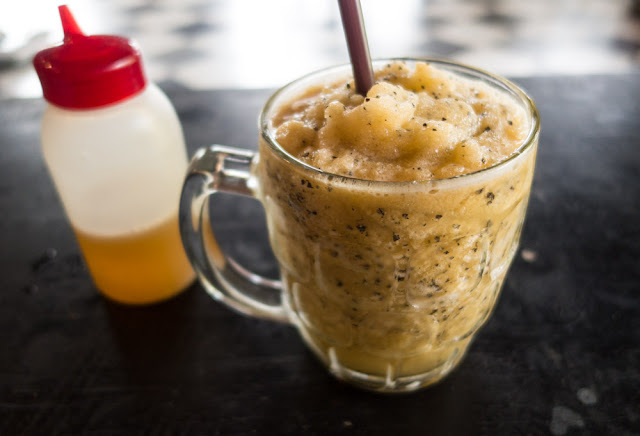 A slushy passionfruit smoothie at 661 cafe (40 baht). Simon had a breakfast bagel. A breakfast burger - bacon, lettuce and egg in a bagel at 661 cafe. I delved into their homemade pesto pasta. It was simple and elegant, a pleasure to consume. If we had a few extra days in Pai, I would have definitely come back to sample more from the menu here. Homemade pasta (perfectly al dente fettucine!) with homemade pesto at 661 cafe (90 baht). And with our bellies full, we went back to our guesthouse, said goodbye to the gorgeous resident dogs, packed our bags, and returned our scooter. Being lazy, we devised a way to cut down the number of trips from two to one. Instead of making one trip to take the scooter back and then making a second trip to to get our luggage and walk to the bus stop, we left the guesthouse in fashionable manner on our scooter, rolling our wheeled luggage slowly alongside us as we carefully navigated our way to the scooter shop. Onlookers laughed, smiled, and gave us the thumbs up. Upon successful delivery of our scooter, we walked to the bus stop from there. I sometimes worry that people who come out with the "too Westernised/not authentic" argument want an ethnic theme park. It's like coming to London and being disappointed that you can't get jellied eels in every cafe - maybe you could in 1910 but... that was then. It can be a complex issue as I do appreciate that tourism shouldn't be everything, and it's good to have a balance. I think there is still plenty of balance in Thailand, though, and there is definitely room for a place like Pai! To me, going to Pai and complaining that it's too Western is like going to Footscray and complaining it's too Vietnamese. "we visited our fair share of lovely little places that are barely touched by tourism, and yeah, part of me kind of wants those places to always stay that way" Oh me too, I never like change like this. It's the paradox of travelling. That food looks so delicious though! Yes, I really enjoyed the food! aargh, ignore my rambling, I'm already following you on insta. Early dementia obv.